A cuppa coffee with your buddy , a box of chocolates to celebrate a birthday, a can of coke with your burger, a drink or two for your friends in the dormitory to stay up to finish their assignment or a glass of tea for the fitness enthusiast - they all have that controversial ingredient - CAFFEINE! What is caffeine? Caffeine is a chemical found in the leaves, seeds, nuts and fruits of some plants. 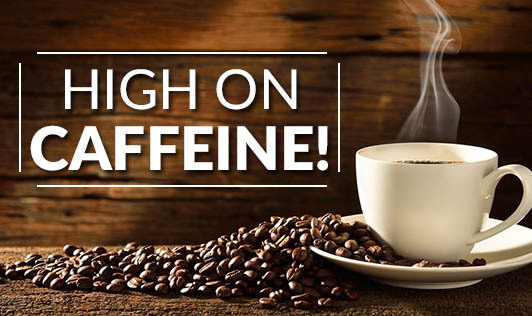 It is known to be a central nervous system stimulant and it is this property of caffeine that gives you the ‘high' that keeps you up all night when you're trying to finish up some work! Do you suffer from caffeinism? If you feel jittery and light headed after consuming large doses of caffeine, experience sleep disruption, are restless, irritable, have an increased heart rate, sweat profusely and feel light-headed, you are probably addicted to it. Beverages like coffee, tea, carbonated drinks, energy drinks, chocolates and all cocoa containing products like candies, ice creams and cakes contain a certain percentage of caffeine. Many people are addicted to it while some have them occasionally. For all you caffeine lovers out there, there is some good news too! When caffeine is had in small doses they can be beneficial to your health, but you must know where to draw the line! If you are trying to have a baby and you are a caffeine addict, here is something you should know. When taken in large doses, caffeine does have an effect on the female reproductive hormone - estrogen. The hormone is involved in maintaining regular monthly ovulation cycles and is important during pregnancy. Caffeine present in two or more cups of tea/coffee is capable of increasing the level of this hormone and can cause irregular periods, breast cancer, ovarian cancer and osteoporosis if taken over a long period of time. These hormonal changes in a woman's ovulation cycle can affect conception and the process of subsequent implantation. Hence, excess and long term consumption of caffeine (>200mg daily) can lead to problems with conception. It's difficult to quit! So do it gradually or you may experience withdrawal symptoms like headaches and nausea. • Try replacing your caffeinated beverages with non-caffeinated ones, like decaf coffee. • Exercise regularly to help combat any withdrawal symptoms and to stay energized. • Stay hydrated. Drinking lots of water will help you manage cravings and fatigue. After all there is a reason why experts say "All is well in moderation!"